Preheat the oven to 400 degrees F. Coat a small baking dish with a little olive oil. Wash the mushrooms thoroughly. Gently pull the stems out of the caps and set them aside. 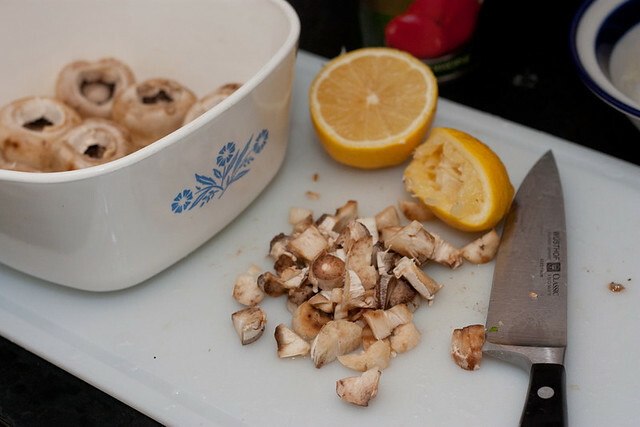 Dip the mushroom caps into the lemon juice and place them stem/cavity side up, snugly together in the dish. Dice the mushroom stems. Saute them in olive oil with the garlic, until the garlic turns golden. 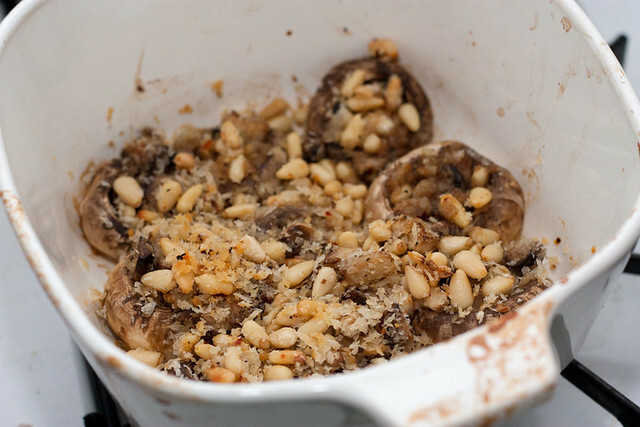 Add the pine nuts, bread crumbs, red pepper flakes, salt and black pepper. Remove from heat. Spoon the sauteed mixture into the mushroom caps, sprinkling any extra on top. Bake for 15-20 minutes and serve hot. If you are making the polenta gnocchi, bake both dishes together around 425 degrees F, and put the gnocchi under the broiler for 2 minutes at the end.